Multiple Ithaca College students said campus police officers have not punished them after being caught smoking marijuana. Freshman Adam* said he thought he was being careful when an officer caught him. He placed a blanket under the door, turned his fan on and faced it toward the open window. He packed a bowl of marijuana into his friend’s vaporizer and smoked his usual amount, he said. About 10 to 15 minutes passed before he heard an authoritative knock at his door. Before this incident, Adam had been caught in early September for marijuana use on campus. Three police officers caught him and his four friends smoking, wrote down their names and student identification numbers, and had them empty their pockets of other marijuana paraphernalia. Adam had to follow the normal protocol for a first-time Level I violation of unlawful possession or use of marijuana at the college, which consists of meeting with a hearing officer, getting a written warning and completing a Web-based educational program that costs $50, according to the document, “Sanction and Intervention Protocol For Alcohol and Marijuana Violations” from the Office of Judicial Affairs. Adam said he felt paranoid that this time he would receive the punishment for a second Level I violation of unlawful possession or use of marijuana, which would include meeting with a hearing officer, disciplinary probation for one year, a final warning before loss of campus housing, parent notification and attending meetings for the “Balancing Alcohol & Substance Use to Improve College Success” educational program that costs $75. The police officer instead asked to see any paraphernalia, gave him a warning and left the room without reporting the incident or taking any materials. There have been several cases similar to Adam’s in which students were caught smoking marijuana and were not reported. Freshman George* said he had been smoking in the woods next to the West Tower parking lot with five of his friends when campus police caught them. He said all of their names and student identification numbers were written down, but the only person who had to follow through with the protocol was the student who claimed ownership of the drug, admitting they had been smoking marijuana from his own paraphernalia. Michael Leary, assistant director of judicial affairs, said the number of students who smoke marijuana on campus is significantly higher than the number of students who get reported. 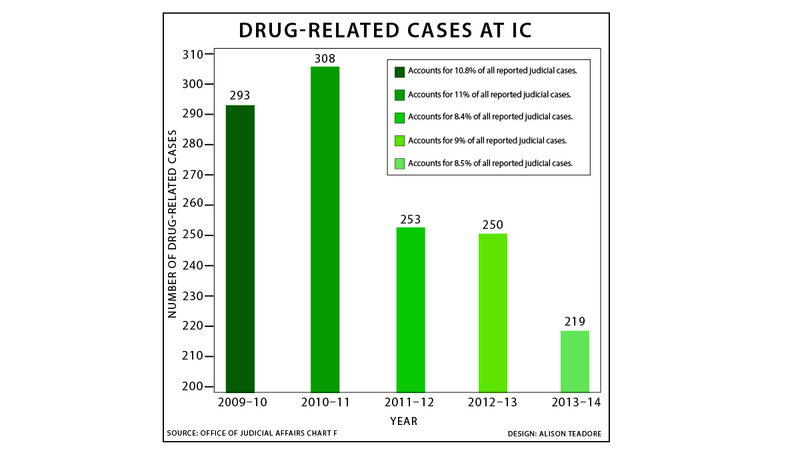 According to Ithaca College’s Office of Judicial Affairs Chart F, entitled, “Cases Where Drugs Were Involved,” which Leary says are mostly marijuana cases, the number of reported cases involving drugs has decreased from 308 in 2009–10 to 219 in 2012–13. Leary also said in the winter there are fewer resident assistants and campus police patrolling outdoors, where many students smoke marijuana. Senior Amanda Hutchinson said though campus police could be putting forth a stronger effort, there are more important things they could be focusing on. Nancy Reynolds, Health Promotion Center program director, said the college has a reduced ability to enforce the marijuana laws on campus because it is limited in law enforcement staff. “If [RAs] were allowed to document marijuana incidents, we may be able to do a better job, but RAs have expressed safety and other concerns about doing this,” Reynolds said. Sergeant Investigator Tom Dunn from the Office of Public Safety and Emergency Management said he thinks the college does a better job of identifying and judicially referring violations of marijuana possession now as opposed to previous years. He said he is not aware that officers are underreporting some cases of marijuana violations. He said officers should be reporting every crime, but in some cases, a marijuana crime could be subordinate to a more serious situation. This may be the protocol in dire situations. However, Dunn said in order to notify Public Safety that the officer gave a student a warning, he or she would have had to record the situation, and this does not occur every time a student gets caught. “Do you report everything? No human being can report everything that they see every time,” he said. Leary said another problem is when an RA or campus police officer cannot tell which residential room the smell of marijuana is coming from. “There may be a complaint called in and Public Safety may come up and will say that they can’t pinpoint the room, so then they don’t document it,” Leary said. In another case, freshman Ben* said he had been smoking in his dorm room in East Tower when a public safety officer knocked on his door complaining of the marijuana smell. He said there was no proof within his room that he had been the one smoking, and the officer left his room without a report. Marijuana usage rates in colleges across the nation are well above the national average. Its use has slowly been increasing, with 15.4 percent in Fall 2011 saying they’ve used in the past 30 days compared to 19.8 percent in Spring 2014, according to The National College Health Assessment survey, which is self-reported by college students. Nationally, support for marijuana legalization has surpassed opposition, according to the Pew Research Center. The study called “6 Facts About Marijuana” found that 52 percent of Americans support its legalization, compared to 45 percent who do not. This increase has been most evident over the past few years where support rose by 11 points between 2010 and 2013, according to the report. As the national view on marijuana use has become more liberal, the college’s policies regarding the protocol on marijuana violations has changed over the years. In response to the NCHA survey, Reynolds said the marijuana usage rates will continue to increase in colleges across the United States as laws become less-restrictive nationally. However, she said that does not mean the college would get any closer to less-restrictive laws. “Even if marijuana were to be legalized in New York state, the campus would still have to remain drug free in order to receive federal funding under the Drug Free Schools & Communities Act, so marijuana will still not be allowed on campus,” she said. When speaking about the enforcement of drug policy and judicial protocol regarding marijuana, Adam said there may be room for improvement. See our infographic on marijuana use nationwide. Read The Ithacan’s editorial on the inconsistency of marijuana reporting.